May 25th 2018 sees the introduction of the European General Data Protection Regulation (GDPR) around personal data protection and privacy and in order to comply there are a few changes I’ve needed to make to VeloViewer, mainly around the public leaderboards, which are detailed below. Basically there shouldn’t be any personally identifiable data shown on the site for other people to see unless you have specifically opted-in to expose it. A while ago I built a visualisation to display the orientation of roads in a defined area and had requests to have a similar view for activities. Well, two years on (I know!) 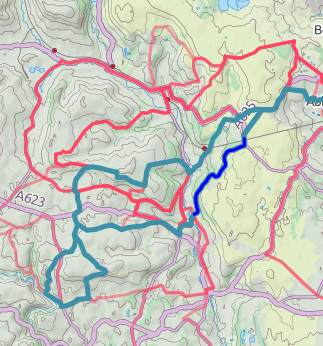 and here it is, with the added breakdown by the gradient of the roads/trails. Just head to the “Breakdown” tab on any Activity, Route or Segment Details page. Filtering the selection in the top profile (Activity & Routes) updates the visualisation appropriately. Viewing your heart rate, pace zone and power zone distributions (i.e. how much time spent in each zone) along with Suffer Scores for individual activities is very straightforward, but only once we see that data represented over longer periods of time do we get a clearer view of how well our training has been going. 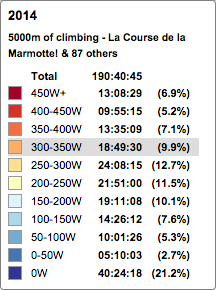 On your VeloViewer Summary page each of these metrics can now be viewed with the distributions clearly displayed with the data grouped over whichever time period you need. 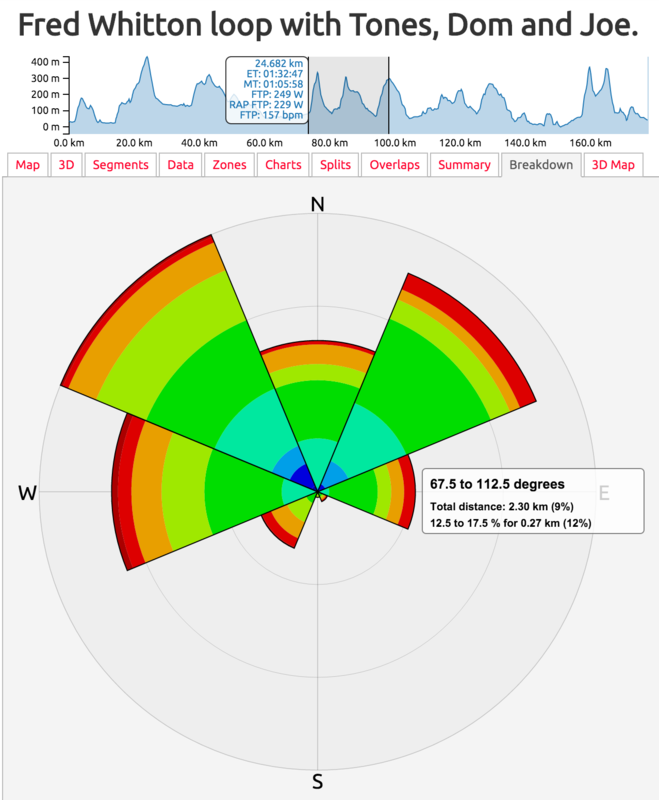 Recording movement using GPS devices is always subject to error but when it comes to elevation data the difference in recorded values between two or more people on an identical ride can be rather dramatic. 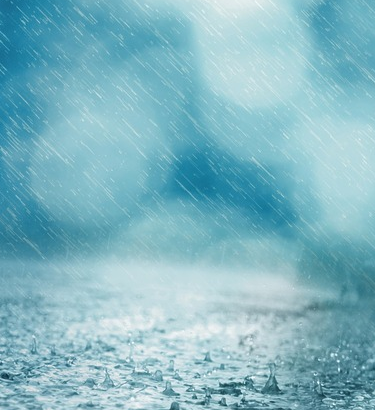 This difference can become even more extreme if the there is some rain in the air when some devices carry on unaffected whilst others hang up their barometers in disgust. Here I’ll present a small comparison of various recordings of elevation from Stage 16 of the 2015 Giro d’Italia which although not a typical ride for the most of us, was affected by fairly typical weather. 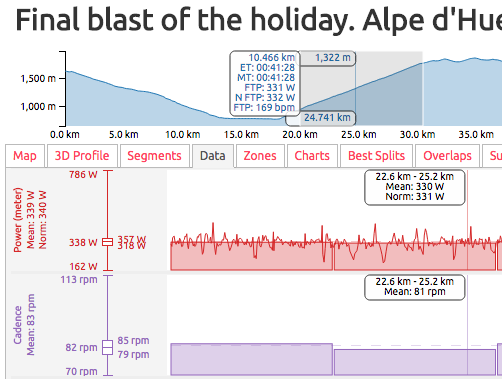 Finding your FTP (Functional Threshold Power/Performance) is a unavoidably painful experience but getting a number out the other end shouldn’t be, which is why I’ve tried to make that part of the process as simple and versatile as possible. 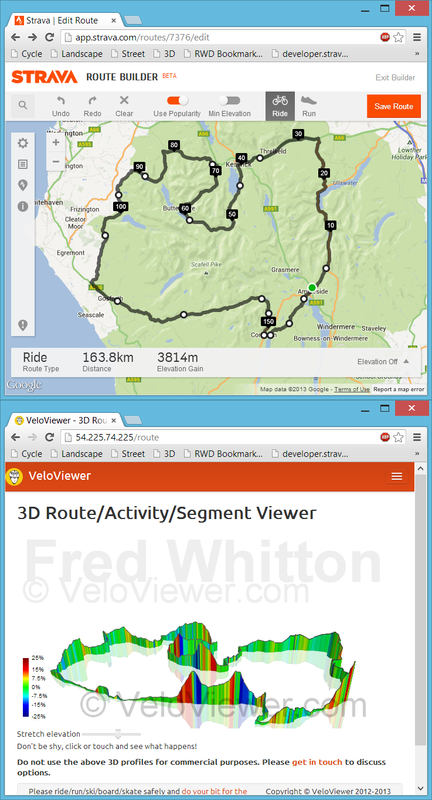 Just sync your data from Strava over to VeloViewer and let VeloViewer do all the number crunching on your behalf. Instantly see your power, normalised power and heart rate based FTPs against all your segments or over any part of any of your activities including your best splits. 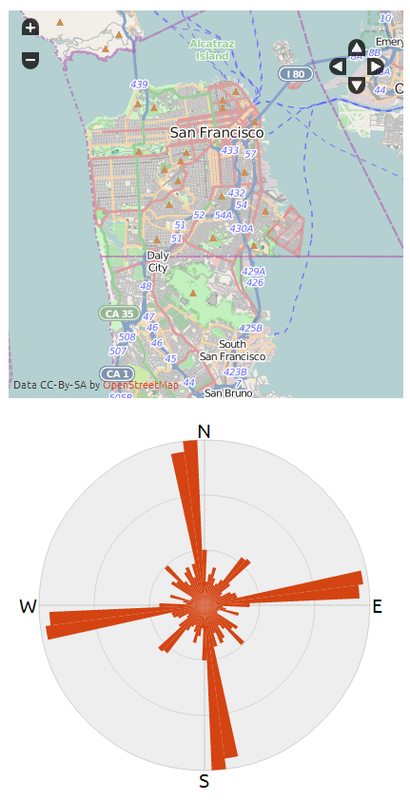 Interactive Road Orientation Distributions – How Ordered is Your Town? Posted on March 25, 2014 | by Ben Lowe | 16 Comments on Interactive Road Orientation Distributions – How Ordered is Your Town? An image created by Seth Kadish at Vizual Statistix caught my eye in my Twitter timeline yesterday showing road orientation distributions (i.e. what directions the roads go in) for a number of US cities. Being British, the idea of roads forming a nice, thought-out pattern is completely alien to me and takes all the fun out of trying to get lost but the visualisations intrigued me none the less. The calculations used by Seth had a few limitations as the length of each street didn’t influence the plot and a twisty street would only register in a single orientation rather than being split appropriately. So time to step up to the plate to see if I can find a more interactive and representative way of doing the same thing. Hopefully you’ll understand how these filters will work and how powerful they’ll be for you.